The Kiwi Kitchen | Mouthwatering food from the kiwi kitchen. Mouthwatering food from the kiwi kitchen. Crunchy, scrumptious onion rings – I have never tried better than the ones I make at home. So easy and quick, I add some of these on to my meal when I have left over beer batter from battering fish. A great snack for the men, my partner loves them while vegging on the couch watching movies. I just love them any ‘ol time. Play around with seasonings, and try different oils for frying – Rice bran oil is my preference, as it has a high smoking point and is better for you than generic canola & cooking oils. Add oil to a pan for shallow frying. Do not skimp on oil, you need the onion rings to be able to float while cooking. Cut onion into 1/4 inch rounds. separate rings, and set aside. Add beer gradually, stirring until desired consistency is reached. I like my batter to be reasonably thick, but easily mixable, not stodgy. Test the oil to make sure it is hot enough – I drop a spot of batter into the oil and if it bubble and goes golden within 1 minute, its ready. 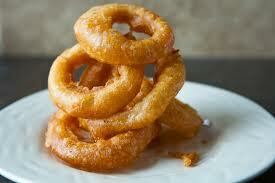 Dip onion rings into batter, and drop into oil. I do about 6 at a time. Cook on one side for 40-60 seconds, then turn and cook other side for same amount of time. Remove from pan and place on a paper towel to soak up any excess oil. When cooked, season with fries sprinkle, cajun seasoning or pepper. Serve with Aioli for dipping – amazing. I have only recently discovered the joy that a potato salad can bring on a hot day with a beer. I made this for the first time about 2 months ago, and now I make it every week either as a side with dinner or to accompany lunch in the weekends. 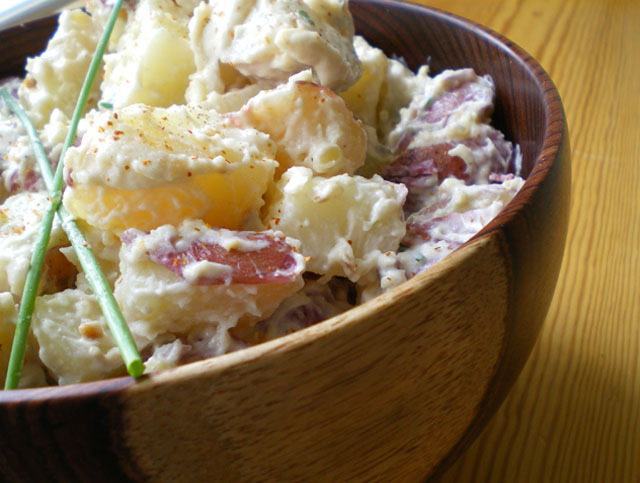 My friends love my potato salad, and it is my must-have for any summer BBQ. The key to a successful potato salad is the cooking of the potato. I steam my potatoes for 15 minutes in a steamer, and this tends to produce nicely cooked potatoes that aren’t too soft. I also make sure that each wedge of potato is the same size, so that they are cooked evenly. You can switch the potato salad dressing for anything that tickles your fancy, I like to use a mixture of Best Foods Mayonnaise and Aioli, or ETA Yoghurt Garlic Dressing. Steam potatoes until just cooked, not too soft. Boil eggs until hardboiled. Put both eggs and potatoes aside to cool. Fry Bacon and dice. Mix together Red Onion, Spring Onion, Parsley, Aioli and Mayonnaise. Season with pepper. When potato is cold, chop hard boiled eggs into quarters and scatter amongst potato. I like to kind of crumble my eggs, so there are small pieces all the way through. Add bacon, toss. Add Mayo mix. Toss gently, making sure all ingredients get well coated. If you feel there is not enough dressing, add more Aioli until desired consistency is reached. This pasta dish is creamy, satisfying and so easy to make. I smother it with crumbled Parmesan cheese and freshly chopped parsley, and serve piping hot with crusty bread. The sauce for this dish can be blended with any pasta – you can use it with spaghetti, fettucine, linguine, raviloi, tortellini, gnocci, the options are endless. For a vegetarian option you can replace the chicken and bacon with sauteed button mushrooms or sun-dried tomatoes, and add 2 Tbsp of Pesto to the sauce for an interesting flavour combination. Saute onion in a pan with a knob of butter until soft. Add diced bacon bits, cook. Remove bacon and onion, leaving the bacon fat and butter from the onion in the pan. This will add flavour to your sauce. Add butter to the pan, melt. Rub the flour into the butter, cook for 1 minute. Gradually add cream, mixing well between additions. Slowly the mixture will become more of a sauce, and less of a big pile of goo. Keep adding cream until you are happy with the consistency. Add Parmesan to thicken & flavour. This will melt into the sauce. Add a pinch of salt & a good amount of freshly cracked black pepper. Add cooked shredded chicken, bacon bits & onion. 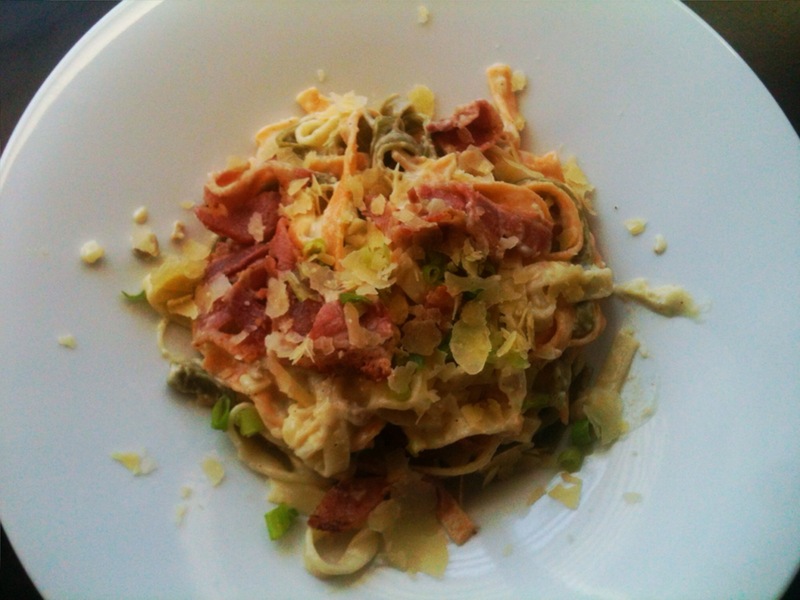 Cook for 5 minutes, adding more cream or Parmesan until desired consistency is achieved. Boil Water, splash with olive oil and add a dash of salt. The oil will prevent your pasta from sticking. Add pasta, cook until al dente. Mix your sauce with the pasta, serve in large pasta bowls covered with a generous amount of grated Parmesan and chopped parsley. When I was small I would cringe at the thought of eating anything green, especially salad. This was because in my mind, salad was a dirty boring tasteless waste of my time, and consisted of lettuce, tomato, and boiled egg. 20-or-so years later, I love including the demure lettuce leaf in an insatiable combination of rich ingredients, whether it be mesculin, iceberg or cos. Croutons, feta, pine-nuts toasted almonds, avocado, mango, sprouts, bacon and apple are some of the ingredients I love to use to spice up a bland salad. 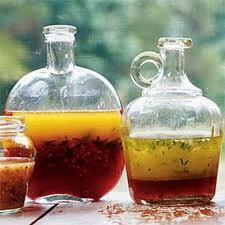 Home-made vinaigrette is also a favourite of mine, so easy to prepare and gives any salad a real kick. Add mustard, black pepper, salt, parsley and lemon juice. Shake well to combine. Add Olive Oil and Balsamic, shake well to emulsify. Store in the fridge, the olive oil will separate from the other ingredients when stored, but nothing a good shake can’t fix. Add more or less olive oil to taste. Parmesan and bacon crusted chicken with basil cream sauce. 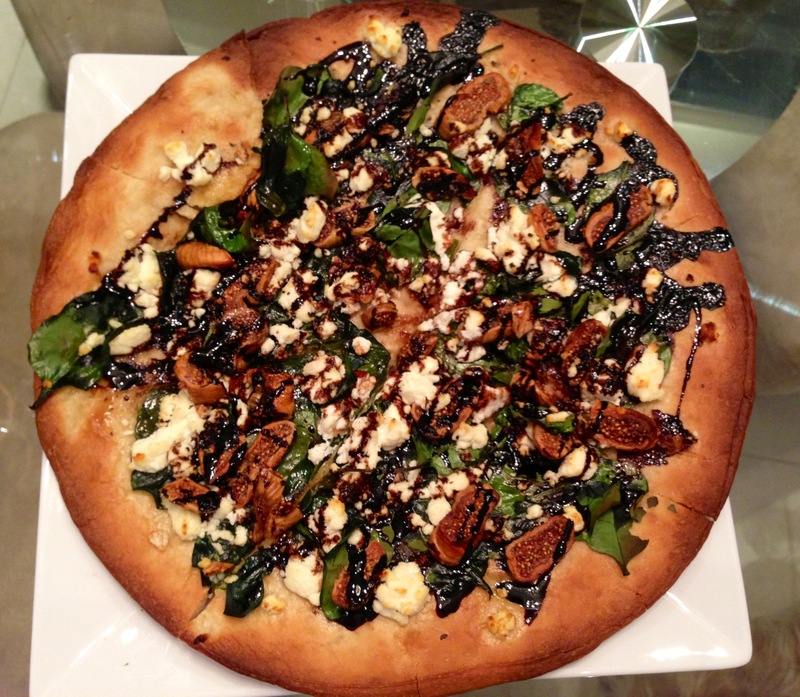 This is an absolute crowd pleaser, and I receive so many comments about how good it tastes. It can be prepared ahead and refrigerated, and then banged into the oven 45mins before serving. I like to serve it with a baby cos lettuce salad, topped with sliced avocado & toasted pine nuts. The Basil cream sauce is the key to this dish – and it is so easy. If you make it too runny, you can add some sour cream just before serving to thicken it up, or add some Parmesan cheese while it is on the heat. You can be creative with this sauce, as long as the cream and basil are the key ingredients you really cannot go wrong. 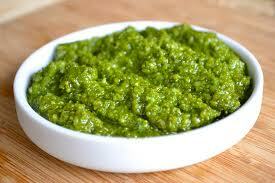 Fresh Basil is preferred, but if you cannot find this fresh, a pottle of ground pesto or even pesto dip will suffice. Add more or less basil depending on how strong you want your sauce. I like a lot. I feel a bit like a protective mother parting with this recipe, I have kept it to myself for so long – but it is time. Spread your wings basil chicken, you have so much joy to give! Preheat Oven to 180C. Line an oven proof dish with baking paper, and fill with chicken thighs. Heat butter in a saucepan with mustard, stir until combined. Pour over chicken. Sprinkle chicken with diced bacon, then the breadcrumbs and Parmesan, making sure each thigh is well covered. Bake for 30 minutes, or until the juices run clear and the crust is golden. Just before you remove the chicken from the oven, begin making your basil cream sauce. Melt butter in a saucepan and add flour to make a rue, this will give you a good base for your sauce. Cook the butter and flour together for around 30 seconds, then add cream gradually, stirring with a whisk after each pour. Make sure the rue combines with the cream, mixing well is key. Add the basil, and simmer for 5 minutes. If you want a thicker sauce, you can add parmesan into the mixture while simmering, or stir through sour cream/whipped cream after the sauce has been taken off the heat. Let the chicken cool for 5 minutes and serve with generous amounts of basil cream sauce. This looks amazing – great stuff lazygirl gourmet!